Like My Photo Gifts is a great website for creating personalised gifts, allowing you the freedom to come up with a completely unique design which is printed onto top quality gifts, using a simple and effective online design tool. Like My Photo Gifts have a large selection of different gifts available, which are suitable for any person, on any occasion. These gifts include personalised photo mugs, personalised photo frames, customisable guitar picks and many more. Recently they have released a new range of Gifts for Geeks from their premises at the Adelphi Mill in Cheshire, which incorporate a whole selection of personalised gifts for the self-proclaimed geek. While Like My Photo Gifts allows you to create any design you want from any image, (as long as you have the copyright to do so) you can also choose from a wide selection of pre-designed templates, all of which are fully customisable using the simple online design tool. What stock designs are available? The stock designs available are still in small numbers due to the product being newly released. 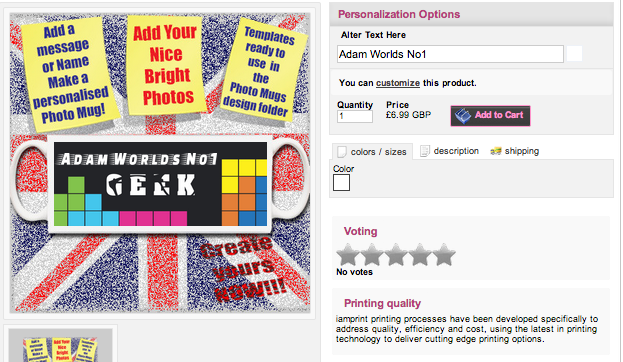 The three choices available on the website are a union jack flag which features text in the centre. This allows you to add either a name or phrase into the image without any hassle. You can create this design with either bold colours or with dissolved colours depending on your preference. The second choice is to create your own personalised beer label which will then be wrapped around the back of your iPhone or iPad. These are not the only stock options available, there are still many stock images unique to Like My Photo Gifts which can be stretched, edited and modified to suit your personal taste. A Tetris style design which features the word GEEK, flower, animals and many more. With over 3000 stock images to choose from, you can be sure to find something which will be ideal for your gift. These images can then be modified using varying colour schemes, photo effects and text, which can all be repositioned anywhere on the case. You can even add multiple layers to create a selection of images and text. How can I create my own design? Creating you own design is just as simple. The only key points to watch out for are to ensure the image is free from copyright restrictions. For example, you couldn’t just search Google and put an image of your favourite cartoon as this would probably breach copyright restrictions. However, if you are a dab hand with technology, then you could always create your own image of your favourite cartoon character, either by drawing and scanning or using computer software, and then upload it into the designer. If you are not sure if the image has copyright, you’re best not to use it. There are plenty of websites for you to get royalty free images if you search the terms in a search engine. You can also use websites like TinEye which will tell you whether or not the images have a copyright. You can also use your own photos, for gifts for family and friends. Photographs of memorable events or occasions, family photos or even pictures of landscapes or circuit boards, often the more quirky the better. Although it is not always obvious, the better quality the image the better it will print. Always try to get a good resolution image, often pictured taken by phone cameras or taken from Google have a low quality which makes them pixelate when stretched. Always try to use a digital camera or pick an image that has a larger resolution for best print results. What other products can be designed for geeks? There are many products on the Like My Photo Gifts website which can be customised for any purpose. Personalised mugs for example can have any design printed on them, so if you are looking to buy a geeky or retro gift, these are a great item to choose. High quality 11oz ceramic mugs which can be printed to a high standard can contain all sorts of crazy designs. You can also design personalised plectrums for music nerds which come in a case for safekeeping, or personalised photo frames which have the image printed into the frame. How does the designer work? The design tool is simple to use. You simply select the product you would like to customise and click on the customize link. 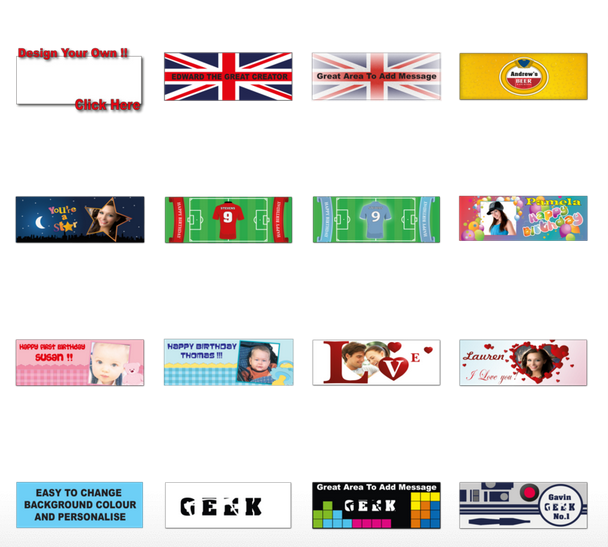 The designer will load and allow you to upload you images using the Add Image tab, insert names or phrases using the Add Text tab and then allow you to customise any of these selections. Along the right hand side you will see all of the different image effects, text fonts and colours, but also a way of manipulating each layer to resize, reposition and rotate. The template design shows you all of the places that might be obscured or not seen at all, so you can make sure the design looks perfect before you place your order. Like My Photo Gifts have their business at the Adelphi Mill in Bollington, Macclesfield. 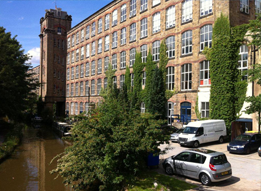 The premises is an old, retired Victorian Cotton mill which has recently undergone a multi-million pound renovation. It has spaces for serviced offices, retail units and storage and has a number of tenants including Like My Photo Gifts. 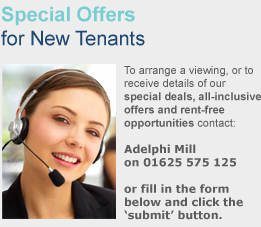 The Adelphi Mill is situated just 40 minutes from the centre of Manchester, which is just 16 miles away. It is also in a prime location near Stockport, which is just 10 miles away. The prime location means the prices of rental are very competitive, which is why Like My Photo Gifts can pass on their savings to their customers. The office space here starts from as little as £23 per week and is perfect for SME’s For more information on units at the Adelphi Mill, please feel free to get in touch.